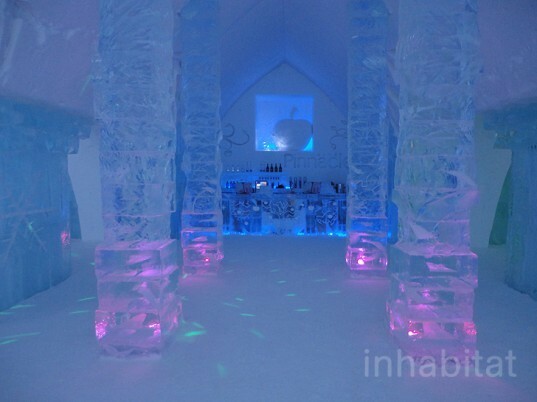 PHOTOS: Inhabitat Spends the Night in Quebec's Hotel de Glace Ice Castle! 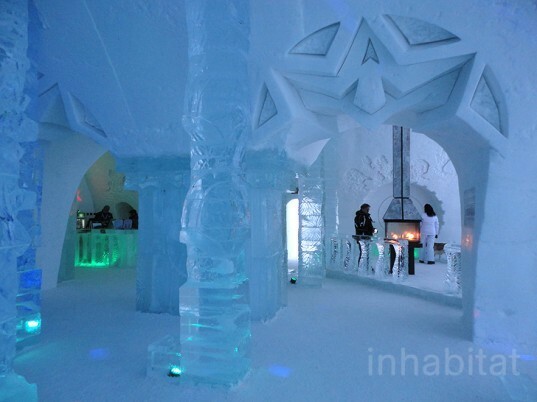 PHOTOS: Inhabitat Spends the Night in Quebec’s Hotel de Glace Ice Castle! 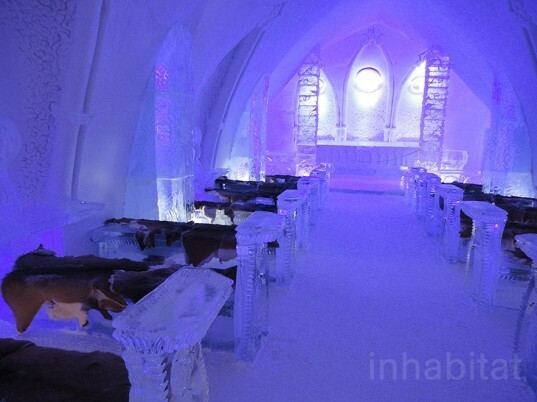 Quebec City’s beautiful Hotel de Glace will open its doors again on 5 January, 2015. In 2012, Inhabitat was on hand to spend the night inside this frosty winter citadel! That year the ice hotel was designed around the theme of The Northern Quebec and was inspired by the art and culture of the First Nations. 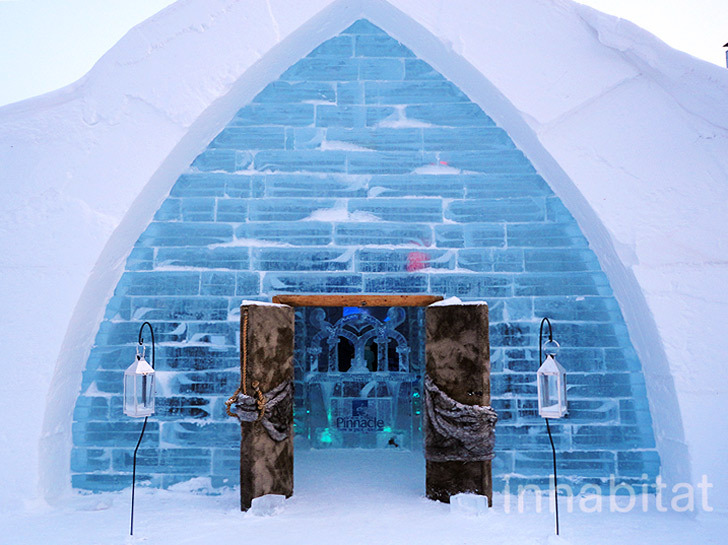 Read on for a first-hand look inside this incredible building made from ice and snow! A visit to the Hotel de Glace is truly a magical experience. After the heated check-in pavilion, a path leads to the pointed arch complex made from snow and ice. Fur-covered wooden double doors welcome guests into each of the main halls, which are made from stacked crystalline ice blocks. Each hall is intricately decorated in both ice and snow carvings that include gorgeous sculptures, delicate furniture, wall friezes and heavily decorated archways. The welcoming hall is flanked by an ice reception desk, complete with an ice lamp, phone and sign in book! Coyote benches line the room, which is set aglow by a giant ice crystal chandelier. Behind the chandelier, kids of all ages can take a ride down the ice slide or poke their heads through an icy fur-hooded body for a photo-op! Opulent ice pillars in the hotel ice bar glow with color-changing LED lights as music pumps out of the ice-encased speakers. Bartenders serve up specialty drinks in ice glasses, which can be a challenge to sip out of! Guests can also relax in the indoor ice seating areas, which are all covered with reindeer pelts in order to keep bodies warm, and the ice protected. Fireplaces keep the atmosphere cozy, but don’t give off any heat – as we all know ice and heat don’t mix! The ice chapel also glows with LED lights, and seats 150 on its fur-lined ice pews. Winter lovers can get married in the chapel, which offers civil ceremonies for a truly memorable wedding. Each day the wintry hotel’s cavernous 36 rooms are open to the public to discover and explore until 8 pm. Each suite has been carved with a different theme – ours featured an igloo-shaped seating area, a wall of fur-hooded natives, and an ice walrus headboard. After an hour of clean up, overnight guests can enter their rooms at 9pm after a crash course in overnight survival. Each ice bed has a mattress, fur cover, and polar-issue sleeping bags that resemble a mummy case. Guests can enjoy cocktails or dancing in the ice bar, then warm up in the outdoor saunas and hot tubs under the stars before bedtime. Once you’ve changed into a new light layer (it is important to minimize humidity, so anything you’ve sweat in must be changed) in the indoor locker room, you’re ready to make the outdoor trek to your room to get to sleep. The sleeping bags keep you cozy and warm, despite the fact that you’re sleeping in a snow cave. The hood protects your head, and candles can be burned to also minimize humidity. LED lights illuminate each room, so you won’t feel lost in the dark. Sleeping in a snow suite is far from luxurious, but it’s truly a once in a lifetime experience that you’ll talk about for ages. For the winter 2014/15 season, the Hotel de Glace is open from 5 January until 22 March, 2015, and advance bookings are available. Special thanks to the Hotel de Glace and Sarah Matthews for inviting us to experience this winter wonderland adventure for ourselves! + More Photos on Inhabitat’s Flickr! I highly recommend the ice hotel for those who love outdoor adventure! A visit to the Hotel de Glace is truly a magical experience. After the heated check-in pavilion, a path leads to the pointed arch complex made from snow and ice. Fur-covered wooden double doors welcome guests into each of the main halls, which are made from stacked crystalline ice blocks. Each hall is intricately decorated in both ice and snow carvings that include gorgeous sculptures, delicate furniture, wall friezes and heavily decorated archways. The welcoming hall is flanked by an ice reception desk, complete with an ice lamp, phone and sign in book! Coyote benches line the room, which is set aglow by a giant ice crystal chandelier. Behind the chandelier, kids of all ages can take a ride down the ice slide or poke their heads through an icy fur-hooded body for a photo-op! Opulent ice pillars in the hotel ice bar glow with color-changing LED lights as music pumps out of the ice-encased speakers. Bartenders serve up specialty drinks in ice glasses, which can be a challenge to sip out of! Guests can also relax in the indoor ice seating areas, which are all covered with reindeer pelts in order to keep bodies warm, and the ice protected. Fireplaces keep the atmosphere cozy, but don’t give off any heat - as we all know ice and heat don’t mix! Each day the wintry hotel’s cavernous 36 rooms are open to the public to discover and explore until 8 pm. Each suite has been carved with a different theme - ours featured an igloo-shaped seating area, a wall of fur-hooded natives, and an ice walrus headboard. After an hour of clean up, overnight guests can enter their rooms at 9pm after a crash course in overnight survival. Each ice bed has a mattress, fur cover, and polar-issue sleeping bags that resemble a mummy case. Guests can enjoy cocktails or dancing in the ice bar, then warm up in the outdoor saunas and hot tubs under the stars before bedtime. Once you've changed into a new light layer (it is important to minimize humidity, so anything you’ve sweat in must be changed) in the indoor locker room, you’re ready to make the outdoor trek to your room to get to sleep.